When a group of kids from a Delhi slum figured out how to navigate the Internet in English simply by playing with a computer for a few days, it was the beginning of a movement to harness the power of self-organized learning. Sugata Mitra’s “Hole in the Wall” experiment has garnered a lot of attention since it first begun in 1999 and won a TED prize in 2013. It demonstrated that a group of students working together, motivated by a deep question and with access to a computer, could produce amazing results. But few self-organized learning environments exist in traditional education. Cleveland is a world away from Delhi, but Dora Bechtel says many of her students at Campus International School remind her of the Indian children she observed in videos about the Hole in the Wall experiment. Her school is housed on Cleveland State University’s campus and uses the International Baccalaureate (IB) program. Sixty percent of its students come from Cleveland itself and the other 40 percent are the children of professors or residents of suburban communities. "Seeing them take charge has really showed us that maybe we are being a little too rigid and structured, and not trusting our students enough." Recently, Bechtel has been experimenting with Self-Organized Learning Environments, or SOLEs, in her elementary school classes. 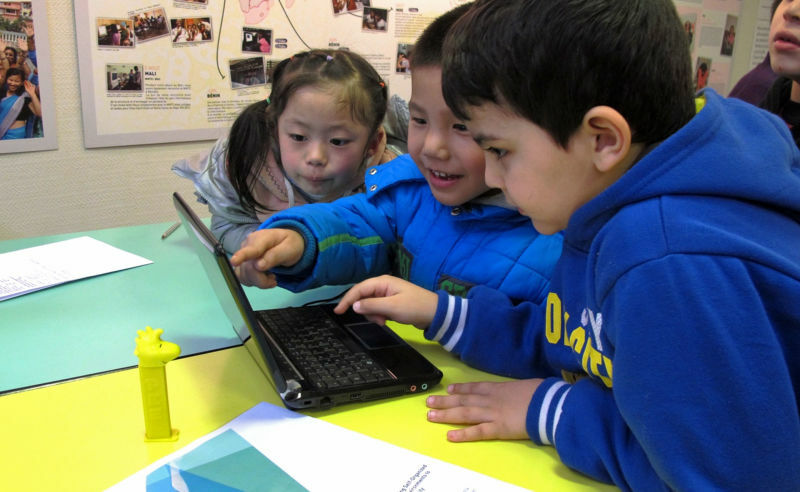 SOLEs are short forays into the kind of self-organized learning that Sugata Mitra found to be so powerful. In a classroom SOLE, Bechtel asks her students a “messy question,” something that doesn’t have just one right answer, then sets them loose to research the question in small groups. Students choose who they work with, find their own information, draw their own conclusions and present their findings to the whole class. It can be a bit chaotic, but Bechtel says that's often good. “There’s chaos and then there’s learning and you can tell the difference,” Bechtel said. She’s excited about SOLE because the method has students asking questions and taking ownership in a whole new way. The IB program already emphasizes inquiry and finding information for oneself, but Bechtel says the total freedom of the SOLE has actually pushed students to go deeper, come up with more varied results and to help one another collaboratively. Bechtel worked with third-graders last year when she first started using SOLEs in her classroom and says she was impressed by how far her students’ curiosity carried them. “We’ve been researching and doing this type of questioning and work all this time, but I don’t ever remember it carrying into home other than homework,” Bechtel said. But after a SOLE, she said, students continued their research at home, sometimes even including their families. SOLEs seed excitement for the learning that will come, and often student presentations touch on aspects of the curriculum that is several weeks down the road. When the class gets there, the kids already have some information about and experience with the concepts and can more easily add to their knowledge base. Bechtel has also found that when she does SOLE, she has less difficulty differentiating her instruction. She has many different ability levels in her class, including several with individualized education plans, some low performers, a few in the middle and several very high-achieving kids. As any teacher knows, finding challenging work for such a varied class of learners is extremely difficult. But because the SOLE is so open-ended, more advanced students are helping struggling students and kids access information in whatever way they can. Bechtel remembers one SOLE where several of her lowest achievers decided to work together. She was worried they would be frustrated, but they happily used the computer to accommodate their learning differences. They found apps that read difficult texts out loud, watched videos and examined images to find the answers to their questions. Meanwhile, some of the advanced learners were finding connections to other areas, asking related questions and researching those as well. Bechtel believes part of her success with SOLEs came from her deep connection to the students -- she had the same group for three years in a row when she started experimenting with the model. The students were comfortable with one another and Bechtel had already taught them a lot of the basic research skills they would need. Other teachers at Campus International are finding success with SOLE, and perhaps even more importantly, Bechtel believes it is changing how the staff thinks about students. “Seeing them take charge has really showed us that maybe we are being a little too rigid and structured, and not trusting our students enough,” she said. Other parts of her classroom are more traditional, with restrictions and supports to help reach all students. But Bechtel wonders if some of those restrictions are holding kids back. “It almost changes the way you see the world,” said Campus International principal Julie Beers. “Students are always coming up with great questions, and then you’re wondering and looking up the answer.” She says SOLEs may start out with a teacher-driven question, but kids come up with their own questions too, some of which are the best ones. One second-grader asked, “Could we hear if our ears were square?” His class did a SOLE to find out more about the physics and biology of hearing. “SOLE has been our training wheels,” Beers said. “We practice it every single week. The students know they are responsible for the information they bring.” SOLE has been a small way for teachers to test giving students more freedom and ownership over both what to learn and how to learn it. And Beers is clear that the technique could work in any school because there are curious kids everywhere. MC2 STEM High School in Cleveland has a reputation for being innovative. The school sets high expectations for the students it pulls from all over Cleveland, and it then does a lot to help them meet those goals. For example, all incoming ninth-graders take Algebra 2 with an emphasis on precalculus and physics. “Our belief is everyone can learn it with the right time and support,” said principal Feowyn MacKinnon. Example search for questions on SOLE Cleveland site. Since MC2 students come from public schools throughout the city, many are used to a much more traditional school setting. MacKinnon says SOLE has been a great way to help incoming ninth- graders learn to be independent thinkers, deep question askers and researchers. “We wanted to shift it so they are carrying the load of learning,” MacKinnon said. Every year ninth-graders do an end-of-year project called “Rockets and Robots” where they eventually build both a rocket and a robot. It’s a transdisciplinary project and teachers saw SOLE as a perfect way to integrate the ethical questions about technology and society. Students did a SOLE on the question: "Just because we can make the technology, should we?” Students delved into the ethical complexities of technology and human life. “The SOLEs have really worked out well when they are value questions or questions that students can have opposing answers to,” MacKinnon said. At first students didn’t really understand how to ask their own deep questions, but as they research they get curious and the questions naturally pop up. Peers are important to this process as well. Students try hard to present a different perspective from other groups. “They saw that they were producing the same answers as some of their classmates so they dug deeper,” Mackinnon said. They went beyond their gut reaction to a question and really looked at all sides of the question. 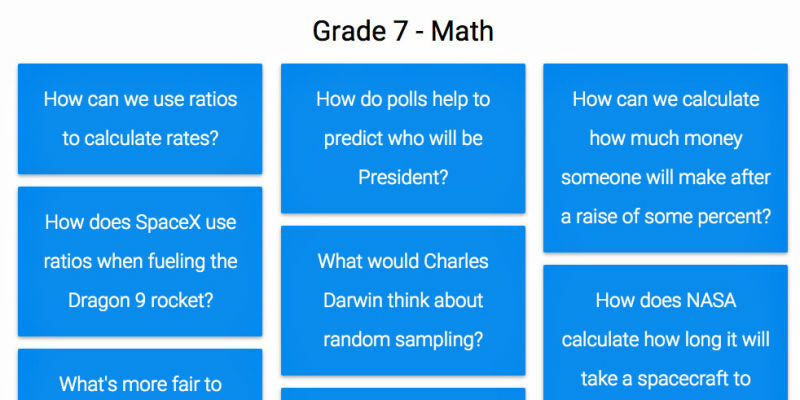 It took ninth-graders a little while to get used to driving their own learning, but with practice they are now approaching every topic with their own essential questions. Seniors are even questioning why they have to take state standardized tests, a headache for MacKinnon, but one she says she welcomes if it means the school is producing students that question the world around them. MacKinnon has noticed SOLEs work best when the teacher is completely hands off. When teachers try to structure the research or walk around reminding students of the task, they are inadvertently bringing the focus back to themselves as authority figure. Students tend to direct questions to them about whether they’re doing the assignment correctly. When teachers step back, students step up. “A lot of my ‘worst kids,’ the kids who are behavioral challenges -- I call them pineapples (prickly but sweet) -- they really excel in the SOLE,” McKinnon said. In a SOLE about what type of renewable energy would best serve Cleveland, MacKinnon remembers how much one of her “pineapple students,” Aaron, excelled at the assignment. Aaron is that smart kid who just can’t sit still. He’s often dancing in class and usually distracting others. “The first time we did a SOLE he loved it,” MacKinnon said. He didn’t join a group, but instead went around to all the other groups trying to convince them of his answer. “Every team would give him a response, so he had 20 people in the class challenging him, but he was in his element,” MacKinnon said. “He got attention; he got to participate in everyone’s group and no one told him to sit down.” When he presented, he already knew all the counter-arguments and could rebut them. “It’s kids like that who typically thrive because they’re allowed to be that person that school is telling them not to be, and that person contributes to everyone else’s learning,” Mackinnon said. Jeffrey McClellan is the SOLE Cleveland evangelist. He’s the founding principal of MC2 STEM High School, but has since moved on to help more traditional schools find workable avenues to experiment with innovative techniques. He thinks SOLE could be the best way for teachers to dip their toes in student-driven learning. The SOLE Cleveland website even has question suggestions for teachers just getting started, arranged by grade level and subject. “SOLE says I trust you to find the information and participate and contribute to the learning of this classroom,” McClellan said. “And it does it in a way that’s really different from other transformation models because it’s this one little slice.” SOLEs can be done in one period or 60 minutes in elementary schools. It’s a way to introduce lots of ideas or dig deeply into one. “Over time you actually hone in on the art of asking questions,” McClellan said. “Kids become much more inquisitive, they start to own their own learning.” And it’s a great way to show kids that the teacher doesn’t hold all the answers. Ultimately it’s up to individuals to find answers to life’s questions. MC2’s current principal, Feowyn MacKinnon, hosts many teachers interested in the SOLE model. They always ask, “What next?” Students did a SOLE, it took a whole class period when none of the formal curriculum was being covered, now how does it connect to the material the teacher is responsible for teaching? “My response to that is you can use SOLEs as often or as little as you like, but it really challenges the way the kids are thinking and it’s going to be a tool throughout all the other subjects and curriculum pieces,” MacKinnon said. She reasons that inquisitiveness, researching and presentation skills, not to mention finding reliable evidence and citing sources, will all be useful in whatever else students do. Plus, hopefully, they will have had a joyful experience of learning.